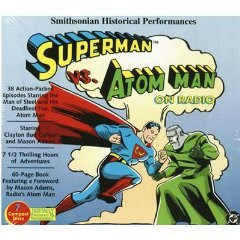 Ten (and then some) things I learned from the Superman Vs. Atom Man radio serial. A while back, I wrote a post about the things I learned when listening to the "Batman's Great Mystery" storyline from the old Adventures of Superman radio show. Over the past few week, I've been listening to the famous "Atom Man" storyline, and while I'm only about halfway through at this point (it clocks in at around 40 chapters or so... even when you're talking about 10-12 minute episodes, that's a hell of a lot of Superman), what I've heard so far has been no less instructive. 2. The hayseed population of Metropolis and its surrounding environs is shockingly high, especially given that we're talking about a city big and urban enough to seem like it actually earns a name like Metropolis. But the second you step outside the city limits, everyone sounds like they're from Hooterville. 3. It was apparently shockingly easy to get someone committed to a mental institution in the 40s, at least in children's radio drama, anyway. Lois suspects Clark has had a nervous breakdown, and two gorillas in white coats show up almost instantaneously to whisk him off to a "rest farm." 4. I said it last time, but it bears repeating... Clark is awful at this secret identity thing. He almost outs himself as Superman at least a dozen times. Maybe if he'd stop the expositional monologues? 5. Need to pad out your storyline? Get someone to doubt you. Just talk about how there's this thing called Kryptonite that can hurt Superman, or how you can create an evil Atom Man to conquer the world, and your friends will spend the next three episodes telling you you're full of crap. 6. Every now and then, the writers throw in a clever gag for the parents. One of the Atom Man's eventual partners, for example, is referred to as "the fat man, whose name is Sydney." And sure enough, the character's voice is a pretty decent Sydney Greenstreet impersonation. This was the last place I expected a Maltese Falcon reference... well-played, Adventures of Superman writers! 7. For being such a recognizable figure, adored and feared the world over, no one ever recognizes Superman the minute his costume is somehow damaged. 7 1/2. Actually, people in the Metropolis area don't seem to notice much of what goes on around them pretty much most of the time. I wonder if there's lead in the water or something? 8. Want a reporter's job at the Daily Planet? Just go right in and ask! No need to provide a resume, a simple verbal summation of your experiences will suffice. I mean, why would you make that sort of thing up? It's not like your a crazed Nazi scientist's secret weapon trying to infiltrate the Planet because of its known close association with Superman or anything, right? 9. In 1945 as now, people knew that Nazis made for perfect scenery chewing villains. They even go so far as to name the evil scientist Der Teufel, which is german for "the devil" (a fact we're reminded of many, many times). I love how wonderfully unsubtle that is. 10. 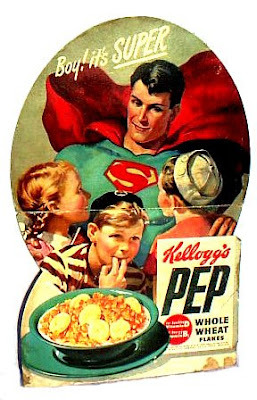 Get all the swell new comic strip character buttons found in every box of Kellogg's Pep, gang, and maybe, just maybe, the announcer will finally stop talking about them. 10 1/2. 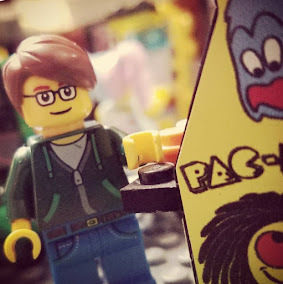 I doubt the veracity of the stories this guy is telling about the kids in his neighborhood and their excitement over those very same swell new comic buttons, by the way. Call it a hunch.